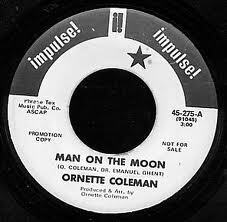 The avant-jazz single Man on the Moon by Ornette Coleman, released in 1969 in response to the first moon landing, features my father, Emmanuel Ghent, on ‘electronic devices’ jamming with Ornette & an all-star band: Ornette Coleman – alto sax; Don Cherry – trumpet; Dewey Redman – tenor sax; Charlie Haden – bass; Ed Blackwell – drums; Emmanuel Ghent – electronic devices. It is curious that the B-side of “Man on the Moon” is named “Growing Up”. For me personally, listening to “Man on The Moon” evokes memories of my childhood. When I was a child growing up in SoHo, Ornette lived in our building. In those years, artists (including my parents) were living in, working out of and renovating entire floors of empty factory buildings in SoHo – all before zoning allowed residential use. In 1970, our building became known for a few years as ‘Artist House‘. Ornette intended Artist House to serve as a live-work performance space for ‘artists of all kinds’. According to jazz.com, residents of Artist House included Anthony Braxton, Leroy Jenkins and Truvenza Coleman, Ornette’s sister. Ornette lived on the third floor and used the ground floor to rehearse and perform. He would come upstairs to my father’s electronic music studio from time to time and they would jam. Apparently my father recorded a few of these sessions, because there are a few reel-to-reel tapes in my father’s archive with Ornette’s name on the spine. Wonder what is on them! Can you imagine? I hope they are still transferable. As you can imagine, as a young child I was fascinated by the electronics. Between falling asleep to Ornette’s rehearsals and having (albeit limited) access to the tape machines, who could resist? It was in my father’s studio, on 2-track and 4-track tape machines, that I began to learn the basics of recording. This is amazing. I’ve been to your father’s apartment when he was alive (with my mother, Lynne Kwalwasser). I love Ornette Coleman and had no idea that he had played there. Wow. 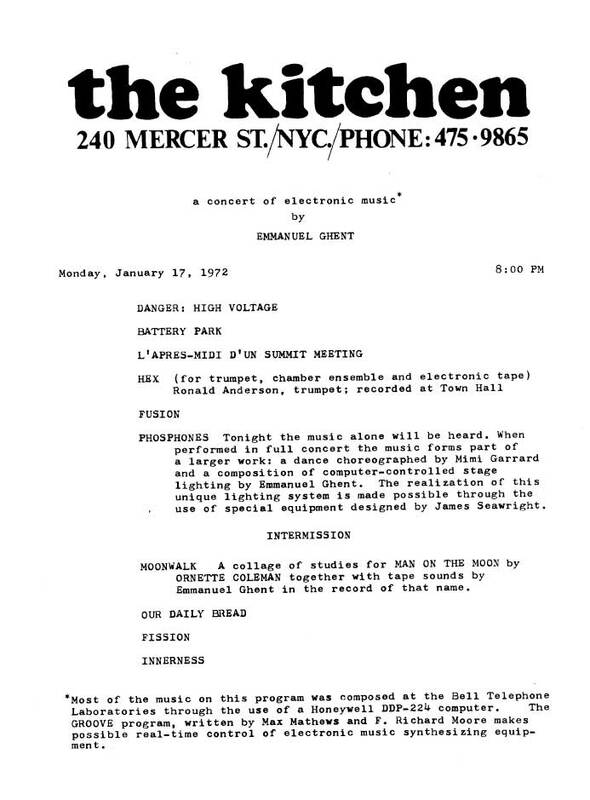 Yes Ornette lived in our building AND rehearsed/performed there. 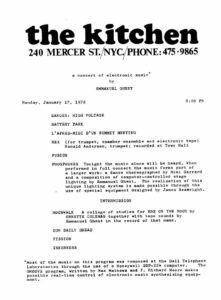 Some old NYC jazz history – and electronic music history too. Hope to transfer the tapes soon! Still waiting on those tapes!!! They will truly be appreciated…I promise..you’re father was a great man as well as artist. I remember how excited my father was when Art Blakey considered moving into our building. It never came to pass, alas. That would have been really cool, Ben! I can imagine it! Ah….SoHo was a very different place in those years. Miss it a lot. The creativity has moved on, now replaced by a giant shopping mall. Sigh. The news that I was searching concernig the label of the first long playing edition. I think my copy could be the first edition of that 7 Inches record. Are you so kind to solve my problem. PS: I’m a close Don Cherry’s fans and I hope that in the archive of your father there are some tunes of him and someone will published it. Grazie mille for your note! I don’t know about an LP edition but will ask around & let you know. Your English is excellent, please no worries! I wish I could speak Italian. I hope we will be able to transfer the tapes in the archive soon! I’m waiting your reply with hoping you will be able to solve my problem. Possibly the unissued material from the Crisis session, is the source of this material, which is extracts from performances. Again: Mike Hames in his discograpy suggests that Don Cherry do not plays on it. Directly, at the Harmolodic web site, Don Cherry do not appears as player so, it is not sure if the trumpet player is Don or Ornette. Could you ask also if Don Cherry’s plays on it? Very very cool… Was just listening to this and it’s far out! Love it! I’ve mixed the last record of Ornette before unfortunately he passed and I would have loved to do more work with him.